I vote amazing. It'll be a little salty, and a little sweet... best of both worlds. Ok I can't lie, it looks disgusting, but I am hoping it tastes good because on paper bacon and chocolate are perfect for each other! Like a porky chocolate covered pretzel...? Ps- appreciate the bump up. Now I am feeling the pressure to STAY up there! good. not amazing. worth trying, but not worth ever making. 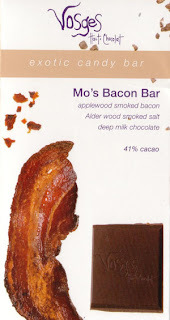 Chocolate coverd Bacon = Unbelievable!! Haha. Candace, guess what your comment reminded me of? "What’s not to like? Custard? Good. Jam? Good. Meat? Gooooood." I love salty and sweet together so I'm thinking awesome! I mean, I love bacon and maple syrup, so choc has got to be good!!!! Eww, is what I have to say. "It's a traditional English trifle! First a layer of lady fingers, then a layer of jam, a layer of whipped cream, sauteed beef and onions, then another layer of lady fingers..."